Painting in broad strokes with performance brushes, the Pirelli Angel GT Tires claim more mileage, more performance, and more fun. This top shelf breed is OEM on the latest Ducati Panigale model and continues to accompany bike releases, like the Bilbao, Spain reveal of the Multistrada 1200S GT. The Angel GT has a hard act to follow as its predecessor is already known as a ground-breaking (or should I say, ground-sticking) model. Boasting 15% more mileage than the Angel ST, Pirelli also states that no performance sacrifices were made. Its wide range of capabilities make it a perfect choice for touring bikes, sport riders, and everything in between. The Angel ST was even chosen as an occasional trackday tire by a few of our contacts. If the GT version proves to exceed this reputation, we could see it on a variety of bikes in quite a few different uses. 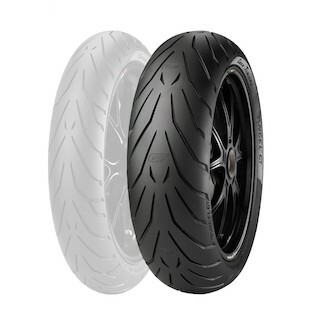 A-Spec rear tires are also available for the heavier bikes, carrying a reinforced 2-ply carcass. This isn't just for fair-weather riders either! The Pirelli Angel tires have an improved groove design that provides excellent water drainage and the higher percentage of silica offers additional wet grip along the edges. Whatever your canvas holds, the Pirelli Angel GT tires are ready to paint it for you.